Scott Rajavuori's Blog | Titus Contracting Design Manager | As the sales and design manager at Titus Contracting, Scott blogs about jobs he's been a part of and issues related to commercial and residential remodeling. As the sales and design manager at Titus Contracting, Scott blogs about jobs he's been a part of and issues related to commercial and residential remodeling. Looking to attract new renters? The latest in design and amenities can help squash competition and make your building the most desirable on the block. At Titus Contracting we specialize in multi housing remodeling in Woodbury and the surrounding areas and constantly stay up to date on the latest trends to help our customers get the very best return on their investment. I’ve put together a rundown of the top trends in multi housing remodeling to watch in 2018 to help you choose what’s right for you and your multi housing property. Luxury living. Renters want to feel they are living in luxury without the high price tag. Through multi housing remodeling you can achieve the luxurious appearance coveted by today’s renters and bring more tenants in; filling your units. Make smart decisions with your materials and finishes, choosing ones with high aesthetic impact for a more elegant and attractive look to your units. According to Building Design & Construction Magazine “Many renters may aspire to live in or close to downtown, but that lifestyle doesn’t come cheap. A significant percentage of prospective renters are in a financially fragile state, and their housing options are narrowing as more and more developers and investors slavishly pursue deep-pocket customers.” This means, multi housing remodeling that evokes the appearance of luxury will be a major player in the years to come. High-service, high-amenity living. With today’s health-consciousness, having an on-site fitness center is an attractive amenity to a lot of prospective renters. Titus Contracting has constructed plenty of fitness centers throughout the years, so we can help add one to your building, along with any other amenities you need to enhance the appeal of your property. Millennials will trade space for location and want to live near like-minded people. They also want a low-maintenance, urban experience, enhanced by amenities and technology, that create a communal live-work-play lifestyle. Some renovations that could accommodate this live-work-play lifestyle include on-site gyms, common areas, easy, efficient laundry, cafes and more. Do you need help deciding what’s right for your property? The multi housing remodeling experts here at Titus Contracting can help! We know just what tenants are looking for in your area and work with you to design updates with the ultimate impact. Do you want more information about multi housing remodeling in Woodbury? Call us here at Titus Contracting at 952-746-7817, or you can contact us for a Free Estimate. 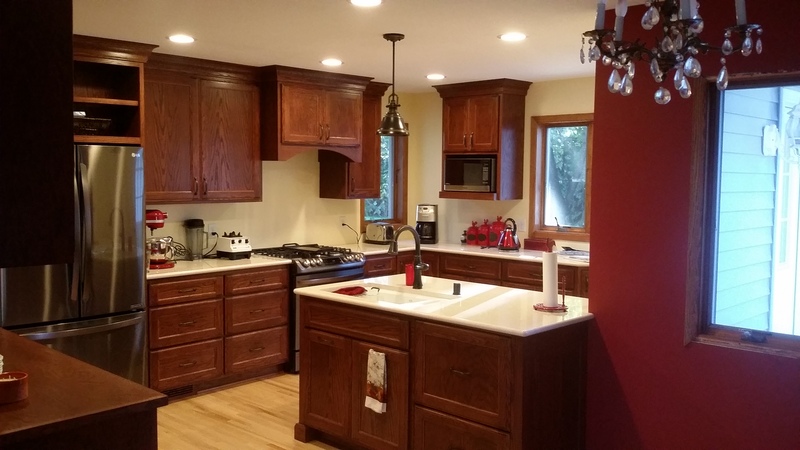 Titus Contracting and Scott Rajavuori recently completed a home addition and kitchen remodel in Plymouth, MN. The clients for this project were referred to Scott in February 2017 through a friend who had worked with Titus Contracting in the past. The Plymouth couple were considering a kitchen addition and remodel, with a desire to have the project designed and built starting in the late spring or early summer. Scott met with the couple for a few initial design meetings where their needs, wants and wishes were worked through and the remodel budget was discussed. Titus Contracting was then awarded the design/build contract. Scott completed the preliminary scope of work, then the Titus team began the design work that would turn the Plymouth customers’ dreams into reality. The design work of a project typically includes creating conceptual plans and layouts of the space, working out options for materials and finishes, and ensuring that everything encompasses the vision and budget of the clients. The kitchen and addition design were both completed by the end of April. Site meetings took place and a residential remodel construction agreement was signed. In late June 2017, Titus Contracting broke ground on the addition. Prior to starting any project, all of our clients are provided with a detailed construction schedule they can follow as part of our desire for clear communication. An important goal for Titus Contracting is clear communication with our clients and excellent schedule management. This particular project was completed on schedule! This kitchen addition and remodel included complete demolition of the existing kitchen location. Then the following new components were added: foundation, framing, roof, siding, windows, insulation, drywall, custom cabinets, hardwood floor, Cambria tops, appliances, painting/finish and millwork. In addition, the homeowners asked us to enhance the front façade of their home by adding a new stoop and front covered entry. We are grateful to these clients for choosing Titus Contracting when considering a huge project like adding onto their home. Most homeowners consider the kitchen the “heart beat” of the home, so remodeling this area is always a great asset. These Plymouth homeowners now have a beautiful space to enjoy with family and friends. If you would like more information on home additions or kitchen remodeling, give Scott Rajavuori a call at (952) 444-2301 or Contact Scott Here. The game room. The man cave. The den. The basement can become anything you dream it up to be. Especially after it’s been finished, remodeled and transformed by the experts here at Titus Contracting. Need a new space to entertain guests, watch the game or work on your favorite new hobby? 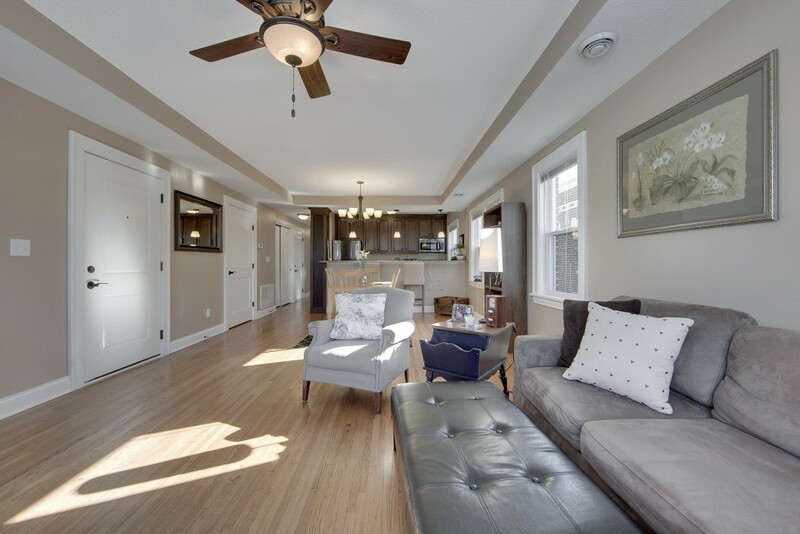 Lower level finishing for your St Paul home is the solution for you! We have completed basement remodels in St Paul, Minneapolis, Plymouth, New Brighton, Minnetonka and many other Twin City communities. The three things they all have in common: great design, an awesome finished product and all on budget. So, if your basement is being used only as a storage area, why not turn it into “the place” to be? From an awesome home theater, to a game room, to an extra bedroom, playroom or office, there are many ways the lower level of your home can be transformed from wasted to wonderful. Lower level finishing and remodeling are some of the best home renovation projects for homeowners looking to get the most out of their home. Lower level finishing is the opposite of one-size-fits all. You could have the entire space made into a home bar and entertainment room; or, section off a home office, create a bedroom for the in-laws or incorporate a playroom for the kids. Really, whatever you can imagine me and my team can design! Everyone knows a finished basement is a major plus when searching for a new home. Lower level finishing can add major appeal to your home when it’s time to sell. And, since the basement is already a part of your home, there are no costs associated like with building an addition. The foundation, load-bearing walls, floors and ceiling are all already in place, so that eliminates the need and costs associated with building a new part of your home. You get additional space for you and your family to use at a fraction of the cost. And, finishing your basement also means it will be more energy efficient and help save on utility bills. We can fix any air leaks or insulation problems as well as put in new, more energy-efficient windows. You might use your basement for storage right now, but think of all of that wasted space you and your family could be using! There are so many different and new purposes for your basement when you entrust me and my experts to tackle a lower level finishing project. And, these are just a few of the many reasons to choose lower level finishing for your St Paul home! Call Titus Contracting at 952-746-7817 or you can Schedule a Consultation to learn more. It is finally Spring again, and that means many of you are thinking about hiring home remodelers for your latest house renovations project. As the Design Manager for a company of home remodelers in Minneapolis, Titus Contracting, I have some advice on how to prepare for a renovation project. Do you have a budget in mind for your home remodelers? A company like Titus Contracting can work with you to stay within your budget during the home renovations process. Your budget will obviously depend on the scope of the project and what you want done to your home. But home remodelers like us can help you get the best bang out of your home remodeling budget. When you call your home remodelers, we will meet with you to discuss what you want out of your renovations. We will come to your home and meet with you to go over what you want and need. But it is helpful if you already have some plans and ideas in mind. Even if you are not an artist, you should still sketch a few ideas for us so we can get an idea of what you are looking for. We will incorporate as many of those ideas as possible into the final design for your home. One big thing to consider when you are planning your renovations: how long do you intend to stay in your home? If the answer to that is just a few years, then you might want to go with a home remodeling project like renovating your kitchen and upgrading your appliances, countertops, cabinets and other aspects. But if you are thinking you want to stay in your home for a long time, then your renovations can be more customized to your wants and needs. As home remodelers, we understand that you are not only working within a budget, but you also probably have a timeline in mind of when you want the renovations to start and when you are expecting them to end. Titus Contracting works very hard to stay within the scheduled time frame, although sometimes things come up that are unavoidable. But home remodelers like us know how to work efficiently without sacrificing attention to details so we get the work done in the correct time frame. Are you interested in learning more about home remodelers in Minneapolis? Then call Titus Contracting at 952-746-7817, or you can contact us to Schedule a Consultation. When people come to Titus Contracting to talk to us about lower level remodeling in St Paul, one of the most popular ideas we hear about is turning a basement or part of a basement into a playroom for the kids. Here are a few reasons this is a great idea and something that families of all sizes should consider when tackling a new lower level remodeling project. You never have to worry about a messy playroom if you have one put in your home’s lower level. Hiding the mess is as easy as shutting a door or simply entertaining your guests on your upper level. The kids will never have to scramble to clean up their playroom, and you will not have to worry that your guests will see a messy room. A lower level remodeling project that includes having a playroom put in can help ease some of the stress you feel when guests are coming and your house isn’t as presentable as you want it to be. A playroom in your basement makes it easy for you to keep an eye on your kids and their friends when they are playing. You can relax in one part of your basement while keeping a watchful eye on the kids and what they are doing. When you call us for our lower level remodeling services, we can talk to you in more detail about the type of playroom you’d like us to put in, and we can make sure we add some comfortable seating for adults too. You and your kids will enjoy having a set area to entertain your kids’ guests. You will not have to worry about your kids and their friends tearing up the bedroom or living room anymore! A playroom in the lower level means the kids can play down there, safely, and you can rest easy knowing that any mess they are making will be in the playroom only. No need to clean up several different rooms after your kids’ friends leave. The mess will be in just one room: the playroom. As you can see, there are several good reasons that a playroom might be a great addition to your next lower level remodeling project. Are you interested in learning more about lower level remodeling in St Paul? Call Titus Contracting at 952-746-7817, or you can contact us to Schedule a Consultation. It is the end of the year, so you might be thinking ahead to some New Year’s resolutions. One of the most popular resolutions is home renovations. And one of the most popular rooms to renovate is the kitchen. Titus Contracting can help with your kitchen renovation in your Eagan home, and we have a few ideas you might want to consider when you’re thinking about your kitchen remodeling plan. When designing your kitchen renovation and thinking about your new cabinets, you should consider putting in some open shelves. This is a great way to display decorations and knick-knacks, and it can be more visually appealing than just a line of cabinets. Open shelves can make a small kitchen feel larger. A kitchen renovation is a great time to get new appliances. You can get ones that are energy efficient, which could save you some money on your utility bills in the long run. Nowadays, appliances come in all colors and styles, so you will have a variety to choose from. You should also pay attention to the smaller details of your new kitchen. Take the time to shop around for some nice knobs and pulls for your kitchen drawers. This is a great way to add some personality to your new kitchen. This is another great way to add some personality to your kitchen. The kitchen renovation process is a great time to update your lighting. Instead of harsh overhead fluorescent lights, look into a mini-chandelier or mini-pendant lights. You still get all of the benefits of overhead lighting but with a little more pizzazz. Think about what kind of kitchen sink you want. Do you like the look of a deep farm-style sink? Do you prefer a double sink? A kitchen renovation is a great time to get an updated sink. Try to find one that is as functional as it is pretty. Your new kitchen’s flooring is as important as the cabinetry, countertops and appliances. Make sure you don’t neglect it, and give some thought into what type of flooring you’d like and what type will complement the rest of your kitchen. Do you want to learn more about how to hire Titus Contracting for your kitchen renovation in Eagan? Then give us a call at 952-746-7817, or you can contact us and Schedule a Consultation. Scott Rajavuori, home remodeling professional working near St Paul, has learned a thing or two over the last 25 years. He is currently the Manager of Sales and Design for Titus Contracting- a home remodeling company serving Minneapolis, St Paul and the entire Twin Cities Metro. As the manager of sales and design, Scott Rajavuori is involved in much of the planning process for the home remodeling projects that Titus Contracting handles. From that experience, Scott Rajavuori has two major pieces of advice. It’s important to have some extra funds available for your project. It’s happened in the past where minor changes turn into major changes, and before you know it the project is more expensive than you planned. It’s best to have the flexibility to be able to make updates if they’re necessary. Without some extra funds in place, you may be in the tough situation of sacrificing your wants for your budget. Overall, a good plan and a good budget will get you set for the home remodeling project of your dreams. Scott Rajavuori has the experience to lead you down the right path. If you’re ready to start a home remodeling project, contact Scott Rajavuori at Titus Contracting to get started today. Call 952-746-7817 or Contact Scott Rajavuori Here.